New evidence has emerged in the mystery of Mom's attempts to gain an early release from a summer camp nearly six decades ago. 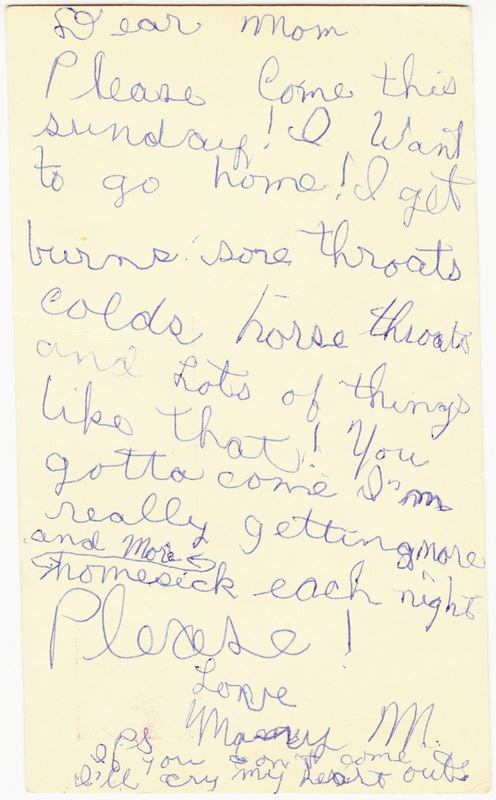 Last week, I featured a cartoon postcard that Mom drew, pleading to her mother to come and rescue her from Camp Chesapeake in Maryland. That postcard, though compelling in its content, was never mailed. But this newly discovered postcard was mailed. Please Come this sunday! I Want to go home! I get burns, sore throats, colds, horse throats and Lots of things like that! You gotta come I'm really getting more and More homesick each night. Please! P.S. If you can't come I'll cry my heart out. I'd say that's about a 9.5 out of 10 on the Child Melodrama Scale. Today, I reckon something like this would be sent in a series of text messages, with many emojis. As I mentioned, this one was mailed successfully to their home in Wallingford, Pennsylvania. It was postmarked in North East, Maryland, on August 1, 1958 (a Friday). Mom was 10½ at the time. I no longer have any way of confirming if Mom's pleas worked and earned her an early retrieval from camp. But I do believe that the following summer (1959) was her first year at Camp Lochearn, which she went on to love and enjoy for several years as a camper and counselor. So it's possible that Camp Chesapeake represented a single summer's discomfort before Mom found her perfect camp fit.